Can’t decide? Try a sampling of our most popular appetizers! Towering Inferno Boneless Chicken Tenders, Hansel & Pretzel Sticks, Wizard of Ozzarella Sticks & Lord of the O-Rings each served with their signature dipping sauces! We’ve upgraded this appetizer to a huge Bavarian-style soft pretzel baked until a perfect golden brown & dashed with salt. Served with creamy artisan craft beer cheese AND signature brewpub style mustard dipping sauces. Our golden chicken tenders tossed with our homemade buffalo sauce. Served with celery sticks & our homemade bleu cheese dressing. You can be our wingman any time! Premium meaty wings cooked to a perfect golden brown & tossed in a Thai-style sweet chili sauce or a homemade buffalo sauce. Served with your choice of ranch or homemade bleu cheese dipping sauce & celery sticks. After one bite, you'll feel the need... the need to order these again! Enjoy these great & powerful Ozzarella sticks! Mmmm, crisp and golden brown on the outside and warm and cheesy on the inside. Served with homemade marinara sauce. Homemade beef or sweet potato vegetarian chili with quinoa, black beans & tomatoes. These precious onion rings are cooked to a delicious golden brown. One big plateful to rule them all! A Chunky’s favorite since the beginning. PICKLE!!! We dare you to take on this beast. A generous plate of sliced pickles dipped in a flavorful batter & fried until perfectly golden brown. Served with a house made chipotle ranch dipping sauce. A Chunky's Classic! Golden chicken tenders rolled in seasoned bread crumbs and served with honey mustard dipping sauce and your choice of one side. Be the good guy and give this BIG guy a try! This dish has so much flavor as we give you two premium Belgium waffles drizzled in signature Mike’s Hot Honey® and topped with buttery red bliss mashed potatoes & our famous chicken Love Me Tenders. The best part, we pour on country gravy & add bacon! Garnished with scallions. Potter fans, we’ve breathed a little fire into this Buffalo Chicken Flatbread Pizza. This magical pizza has a dangerously delicious buffalo chicken spread topped with fried buffalo chicken, bleu cheese crumbles & a sprinkle of chopped celery. Great Scott, this Pulled Pork Mac & Cheese dish is one of the most comforting, savory & satisfying entrees we ever invented! We dialed up the flavor to 1.21 gigawatts with our signature pulled pork, a drizzle of BBQ sauce & topped with Cajun onion straws for a taste you’ll go back to the future for. Try our legendary golden chicken tenders tossed in homemade buffalo sauce and served with lettuce, tomatoes, and Monterey Jack cheese in three warm & soft tortillas with a cool ranch dressing spread. So good, you'll race for another bite! For our guests 10 & under. Each menu item served with a chocolate chip cookie and your choice of one side. A scoop of vanilla ice cream with chocolate sauce, whipped cream & a cherry. Do not underestimate the power of the dark chocolate cake with hot fudge filling. Served with vanilla ice cream under a drizzle of chocolate sauce. Yes, yes, let the hot fudge flow through you! Human words cannot describe how good this dessert is! A moist homemade mocha chocolate brownie topped with a tall portion of hand-dipped ice cream, chocolate sauce, whipped cream & a cherry! Your mind powers will not work against one of our most popular desserts! 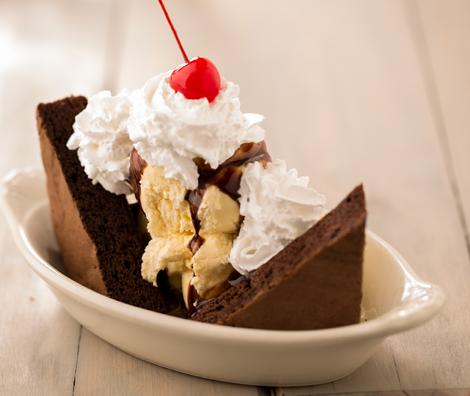 Enjoy an oversized portion of premium ice cream topped with bittersweet hot fudge sauce, whipped cream & a cherry! An imperial portion of premium hand-dipped ice cream topped with whipped cream & a cherry! The force is very strong with this rich cookies & cream mousse served in an Oreo rimmed martini glass, topped with whipped cream & Oreo cookie crumbs. A magically frothy & delicious Barq’s Root Beer, Dr. Pepper or Orange Cream Float with a BIG scoop of vanilla ice cream! Violet, you're turning Violet, Violet! Smirnoff Blueberry Vodka & Blue Curacao form a stunning cocktail that is mixed with lemonade & bursting with tropical flavors. Served over ice with blueberries. The ULTIMATE summer cocktail! We shake together Smirnoff Watermelon Vodka, cranberry juice, and Sprite. Served over ice & garnished with a lemon wheel. You'll run to grab another one of these! Captain Morgan Pineapple Rum, Captain Morgan Spiced Rum, shaken with orange juice & cranberry juice and garnished with an orange & a cherry. Alright, alright, alright. We have found the best new cocktail featuring Smirnoff Watermelon Vodka, Malibu Coconut Rum, Triple Sec & Pink Lemonade garnished Sour Patch watermelon candy! Yes, it is all cupcakes and rainbows when you try our new super tasty drink! Wild Grape flavored syrup mixed with fizzy & refreshing Spite with Sqworms sour neon gummy worms! HOORAY! Hints of ripe raspberry and a velvety smooth vinish. Aromas of fresh citrus, tropical fruits, and Gala apples. The well-balanced acidity brings out the flavors of mineral and grapefruit notes with hints of peach and white melon. Hints of pineapple, mango, papaya, and citrus notes. Hints of green apple, citrus, white peach, and floral blossom. Made with premium Sauza Extra Gold Tequila and our signature margarita mix. Tell them Large Marge sent you! Premium Sauza Extra Gold Tequila, Blue Curaçao and our signature margarita mix. WE GIVE IT A TEN! A signature White Russian with Vodka, Kahlua and milk served in a tall glass with an Oreo cookie crumb rim. A thirst quenching mixture of Captain Morgan's Spiced Rum, ice and Coca Cola. Marvel at this clever & colorful concoction infused with Smirnoff Cherry Vodka, lime juice & sour mix! Served in a tall sugar-rimmed glass over ice & garnished with Sour Patch Kids. First they're sour, then they're sweet! Enjoy it your way with this signature cocktail featuring Jack Daniels Whiskey & Coca Cola. Served over ice in a tall glass! You got this feelin' inside your bones. It goes electric, wavy when you take a sip! Blue raspberry flavored syrup mixed with fizzy & refreshing Sprite with juicy Sour Patch Watermelon candy. A classic drink featuring ginger ale and a splash of grenadine, garnished with a cherry and served over ice.